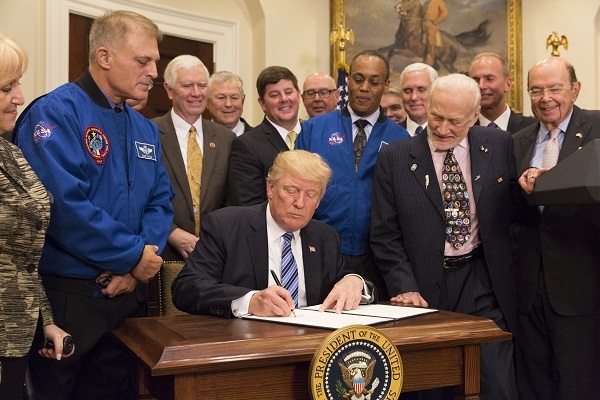 I haven ‘t been able to find a time or agenda for the meeting, but when it does go live the event will be shown on NASA TV (https://www.nasa.gov/multimedia/nasatv/index.html) and the White House Live website (www.whitehouse.gov/live/). Although there is no published agenda, one likely topic of discussion is Space Policy Directive 3, which is focused on how the government will handle space traffic management. The Space Council’s Users Advisory Group is scheduled to meet on Monday at NASA headquarters from 9 a.m. to 2 p.m. EDT. The meeting will be webcast via Webex and be available via phone dial up. Andy Pasztor of The Wall Street Journal reports that former House speaker Newt Gingrich and former NASA Ames Director Pete Worden have been dumped from the advisory group due to issues involving their business and financial ties. And he said that he doesn’t like it when Boeing and Lockheed get together (on ULA), because it always leads to higher prices. I am sure Senators Shelby and Nelson are blowing gaskets about now as he said he will put an end to politics that have prevented the US to return to the Moon, to stay! So despite opposition from pretty much everyone Dim Don Un decides he knows best (he always does right?) and plows on regardless with his grand vision of marines going pew, pew with friggin laser beams in outta spayce. As one former leader of another space based military (ish) outfit might have said “Watching too much sci-fi Donny has”. Here, Donny doesn’t get to complain about NASA-pork given his own rampant corruption and graft in the White House since taking charge. How many golf trips has he taken to his Mar A Lago retreat since seizing power with Russia help? And charging to the Federal Govt at that? So you like NASA-pork and think its a good thing? Why?